At ACHEMA 2012 (18-22 June; Frankfurt am Main, Germany), BioDrop Ltd extended the BioDrop family of products, which represents fresh thinking for micro-volume measurement, with the introduction of the BioDrop TOUCH UV/Vis spectrophotometer. This next generation instrument is ideal for routine measurements in many common life science applications. BioDrop TOUCH features a standard-sized cuvette holder, and is the first instrument to offer seamless compatibility with the new BioDrop CUVETTE for accurate micro-volume applications. An integrated magnetic pipetting station provides easy sample loading. 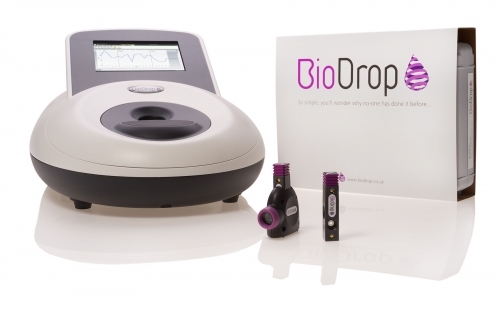 BioDrop TOUCH is available as either a standalone instrument with software controlled via a large, colour, multi-touch display or as a PC only version controlled by the powerful Resolution Life Science Software. USB connectivity offers easy PC connection or export of data and methods. The intuitive touchscreen approach makes for simple programming and access to data. A drop-down menu specifies the path length being tested, making it fully compatible with both BioDrop CUVETTE 125 and 500. A built-in printer can also be fitted to the instrument for a complete standalone solution in a small footprint.